When clients request a quote for new project we take it seriously. Although estimation and analysis require time, we prefer to dedicate more efforts figuring out all details and technical risks from very beginning, rather than promising something undeliverable. We don’t believe in abstract “story points” when preparing initial timeline because developers spend real hours and clients need to prepare a budget in dollars. Thus we evaluate requirements by detecting all 2 to 16 hours long tasks. 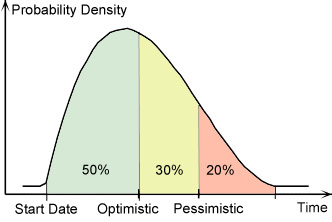 Since estimation of any particular feature is not precise, we determine release date with probability between 60% and 70%. Often it makes sense to start from Proof of Concept project and resolve most dangerous technical challenges in first order. It could take very little time and money to see how your main idea looks in the form of software. Also it gives significant growth of estimation accuracy. 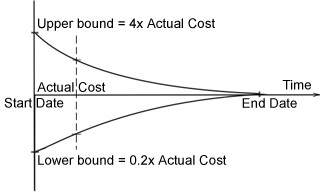 While initially analyst guesses between 0.2x and 4x actual cost, after first iteration or two they give much better prediction.